+ 7UP now 100% natural. 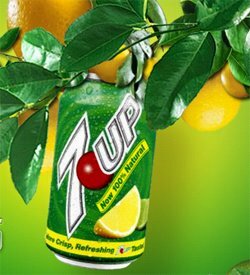 The evolution of 7UP to a 100 percent natural lemon-lime carbonated soft drink is a timely move for the brand's 77th birthday. To celebrate this milestone, the launch of 7UP, now 100% natural, will be supported by television, radio, print and online advertising, significant sampling outreach and retail partnerships, among other activities. Somewhat interesting in light of the benzene in soda and other beverages, a big issue recently in the news.